Bisham Abbey in Marlow, Berkshire is one of Sport England’s National Sports Centres and is home to a number of National Governing Bodies of Sport. Bisham Abbey provides excellent facilities to Britain’s leading sports men and women, and aims to deliver a world class experience. 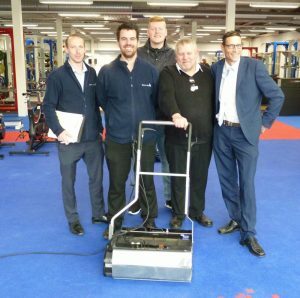 Those same high ideals also apply to the centre’s standards of cleaning and hygiene so Duplex Cleaning Machines were delighted to be chosen to supply their unique Duplex 620 Steam Plus model for use in maintaining the new specialist sports flooring in their recently refurbished gymnasium. A spokesman for Bisham Abbey commented “We were extremely happy with the equipment supplied. From the initial demonstration, to assistance with ordering and finally to the delivery, installation and training all experiences were positive and a great service was provided by Duplex staff. All information was given as required and the equipment supplied is of the highest quality, definitely an asset in maintaining standards in our elite facility.” Comments during the training session included “really easy to use”, “the transport trolley is so well designed, it will make moving the machine around the Abbey really easy”, “I didn’t realise that the machine sanitises without the need for chemical, that means we don’t have to worry about leaving chemical residue on the floor as the steam kills the bacteria, that will be especially good for gym users laying on the floor or working out bare foot”.